Most of the earliest cultures seem to have considered the causal force behind the world as feminine, a Goddess, a Great Mother, who in her concern for struggling humanity, although a virgin without consort, bears a son who is both human and divine, and who as a mortal must die, but in life is on Earth to help humanity with what it needs (but not what it wants!). In many of the legends, this son is connected with a tree. From this the Green Man seems to have been generated, the son of the Goddess here to help us. In England this is acted out in May folk customs in Hastings, Rochester and Castleton, but similar customs are found all over Europe. Independent customs of a similar nature have been reported in Africa. 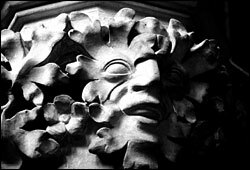 As a carved image, the Green Man is common in Europe, especially in Medieval churches, but has also been seen in Jain and Buddhist temples, Moslem structures and as folk carvings in traditional houses on the Pacific islands. Related images are to be seen in pre-Columbian temples in Mexico, and also in Mexican churches of later centuries. Of course everywhere the majority of the images are probably conventional decoration, applied without profound symbolic intention, and this must have been the case among the thousands found in Medieval churches in Europe, from Ireland to Russia, from Norway to Italy, but particularly in France, England, and Germany. However, they are also found in close association with all the portrayal of all the central events of the Gospels, and these cannot be either accidental decoration or pagan survival. The image was accepted as valid by Christian philosophers and theologians, and observes the Gospel drama as the divine presence in nature, the image of God in nature, an angelic force in nature. Others in the churches are clearly there to guide our behaviour, and some of them are fierce in their insistence on our well disciplined conduct. These days we may see this not only as our personal conduct, but the conduct of the whole of our culture in its treatment of Nature and the world. 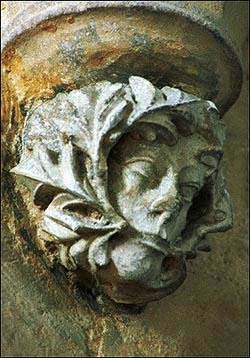 The Green Man is our half-brother, a testing guide for us, a symbol of consciousness in the universe, and a reminder of its role and significance, and to some a sign of divine immanence in the world, the divine consciousness as an observer in the world. His influence is ecological, psychological and spiritual, a valid symbol for our time.